For noise sensitive applications, switching regulators tend to be ruled out due to the disturbing output ripple and noise. Linear regulators win over a smoothed output voltage but they work inefficient and produce a lot of heat. If the circuit has to be isolated, linear regulators are out of question. The power supply of a noise sensitive application calls for a compromise in performance or it requires an expensive filtering. 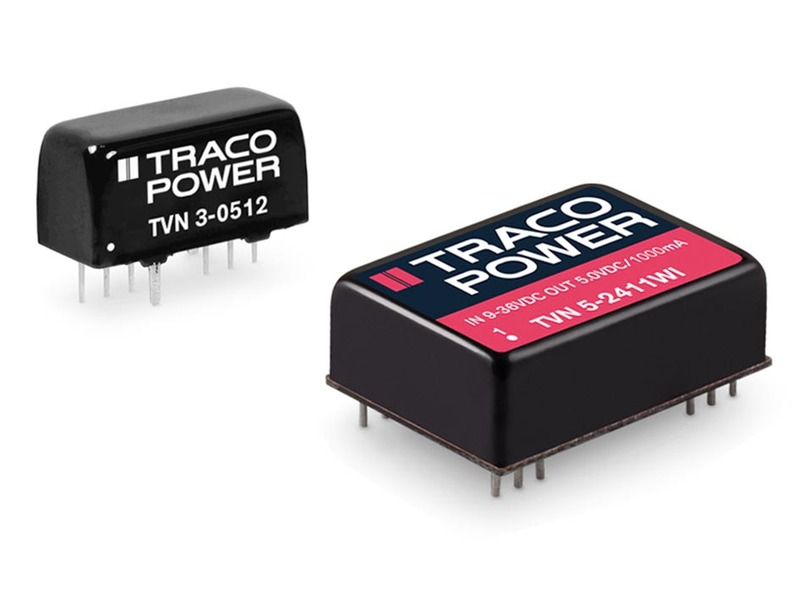 With the TVN 3 and TVN 5WI series Traco Power merges the advantages of switch mode DC/DC converters and linear regulators. These 3 Watt and 5 Watt switch mode DC/DC converters have a functional insulation system that provides an I/O-isolation voltage of 1600 VDC. The output voltage is fully regulated (line/load) and filtered for a residual ripple and noise of 10 mVp-p typ. It can even be reduced to 5 mVp-p by a single external 10 µF capacitor. The expenses for an external filtering can be kept down. With an efficiency of 80-89% (depending on model and operating point) the heat dissipation is very low. The low thermal losses have a direct positive impact to the lifetime and reliability not only for the DC/DC converter but also for the components around it. The TVN 3 and TVN 5WI converters enable a cost efficient high performance solution for analogue circuits and for applications in instrumentation, audio and video, wireless communication, medical instruments, data acquisition systems, etc. The 5 Watt converters of TVN 5WI series come in a six side shielded DIP-24 metal package and have an internal input filter to comply with conducted noise level EN 55032 class B. Standard features include remote On/Off, over voltage protection, under voltage shut down and short circuit protection. Models are selectable with output voltages of 3.3, 5.0, 12, 15, 24, ±5.0, ±12, ±15, ±24 VDC while the voltage of the single output models can be adjusted with an external resistor to -10% to +20% of nominal. They are available with ultra-wide input ranges of 4.5 – 12 VDC, 9 – 36 VDC or 18 – 75 VDC. The 3 Watt converters of TVN 3 series come in a compact SIP-8 metal package. Models are selectable with fixed output voltages of 3.3, 5.0, 9.0,12, 15, 24, ±5.0, ±12, ±15 VDC and they are available with wide input ranges of 4.5 – 13.5 VDC, 9 - 18 VDC, 18 – 36 VDC or 36 – 75 VDC.